What does the color gray mean to you? Typically, gray does not evoke strong emotion. For most people, it’s a staid, dependable color, offering a sense of balance and control. Gray might not be one of your go-tos, but it can add great touches to your crafting. It’s sleek and elegant, a classic color, a natural fit for wedding, anniversary, and sympathy cards, not to mention masculine-themed cards. As a netural, gray perfectly accents home decor projects. 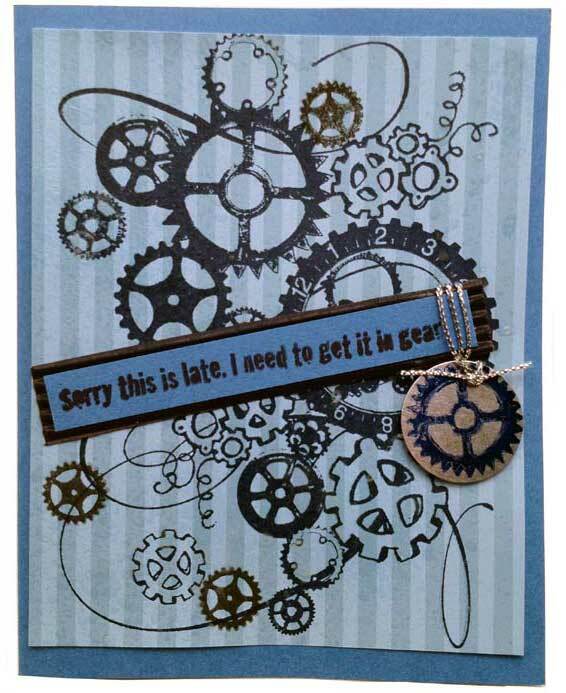 Plus, it offers a great alternative to black for sentiments and background stamping. We don’t have 50 grays (yet), but we still have a wide assortment in a variety of our products so you can stretch those gray muscles. Our recent releases in the gray color family include StazOn Ink and Studio Glaze in Cloudy Sky, shown here in our CHA 2015 booth display. Multi-surface StazOn works on a range of nonporous surfaces; Studio Glaze creates a stained glass effect on transparent glass, among other effects. Another out-of-the-box gray is our irRESISTible Texture Spray in Gray Flannel, which gives you a blast of color along with texture. 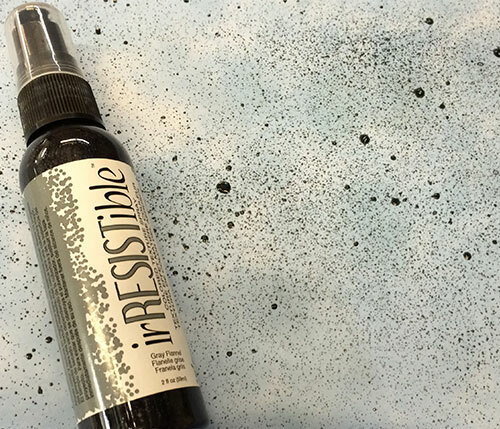 You can saturate your surface with irRESISTible for an intense effect, or lightly mist for a subtle look. Ready for some projects? 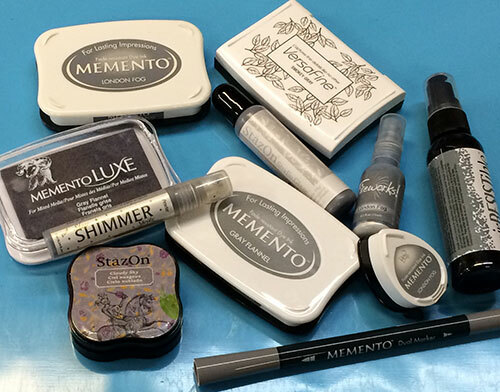 Our “Sunshiny Hello” card uses Memento Ink in London Fog as an elegant contrast to Radiant Neon. 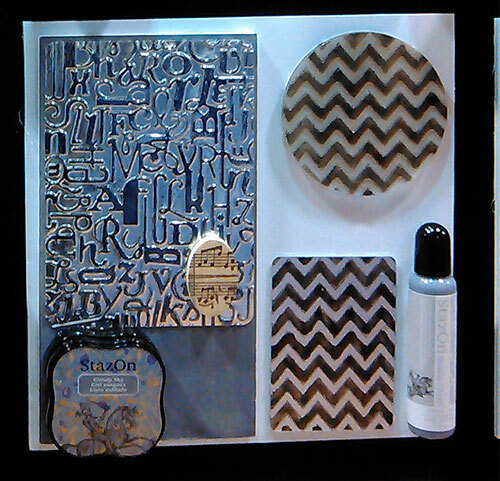 In our “Get It in Gear” card, StazOn Ink in Stone Gray complements a blue color scheme. When you’re ready to craft this weekend — after a trip to the the movies, of course — visit our website for full step-by-step instructions for these and many other projects. How often do you craft with gray? Let us know in the comments! LOVE creating with GRAY! It is a great color to use when you want to make other colors pop or to tone down another color! I use it quite often because it is so versatile! I like the softer contrast gray offers over black. Def. like how it anchors my project with a touch of elegance. I just painted my bedroom and bath in Revere Pewter (it is either a Gray or sometimes it’s beige, so I call it Greige). 🙂 I took a picture, but I don’t see a way to post it here. Will post it on Facebook. It looks real purty!! !